This year we entered the Yorkshire in Bloom Awards for the very first time and the results have given us some very mixed emotions. Great pleasure in that the judges seemed thrilled with what they saw and awarded us with a Gold for our Manor Parks. Huge sadness in that our long standing colleague and friend, Brett Nuttall, died suddenly and very unexpectedly just hours after spending a happy and positive afternoon with the Judges. 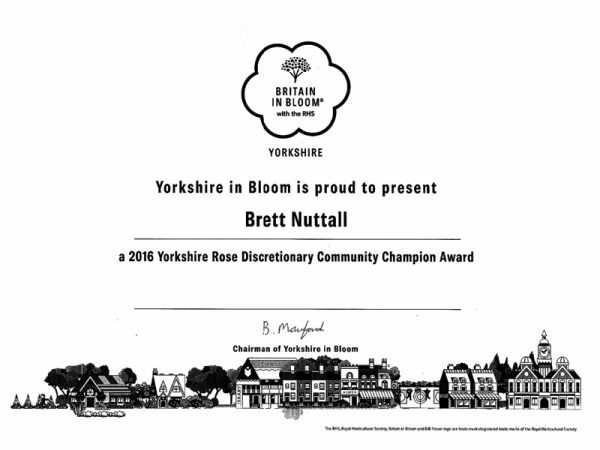 We were extremely moved to know that the Judges awarded Brett posthumously with the Yorkshire Rose Community Champions Award for his services to this community and for his long standing work which helped to achieve our current parks legacy.